Having the calling and commitment to being a visual artist is key, but how do you professionalise your art practice? 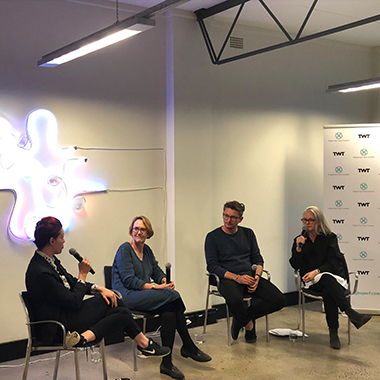 Bridging Hope Charity Foundation in collaboration presented a panel discussion on ‘Professionalising Art Practice’, in the TWT Creative Precinct. Artist Alex Seton, Acting Co-Executive Director of NAVA Brianna Munting, and art-specialist Lawyer Delwyn Everard were in conversation with Art Advisor/Curator Natalia Bradshaw discussing some keys to truly being a professional artist. Alex Seton stressed the importance of having a concerted business plan that is continually finessed; Brianna Munting exemplified how NAVA membership can providing insurance cover, general tax advice and other mandatories to being a polished arts professional; and Delwyn Everard outlined the issues around business governance, contracts, and intellectual property especially concerning visual artists. Couldn’t make it? Listen to the recording from the night.